Every year in April, we survey the HMS medical students about their use of mobile devices. At HMS, we encourage students to buy the device of their choice - iPhone/iPod/Ipad, Android, Blackberry, Kindle etc. We then support these devices with software licenses and controlled hosted applications. Our Mycourses Learning Management System has a Mobile Applications tab. Under General Resources, we offer a mobile version of all course content via connected devices (WiFi, 3G etc.). We also offer a Kindle version for downloading course content to the device. 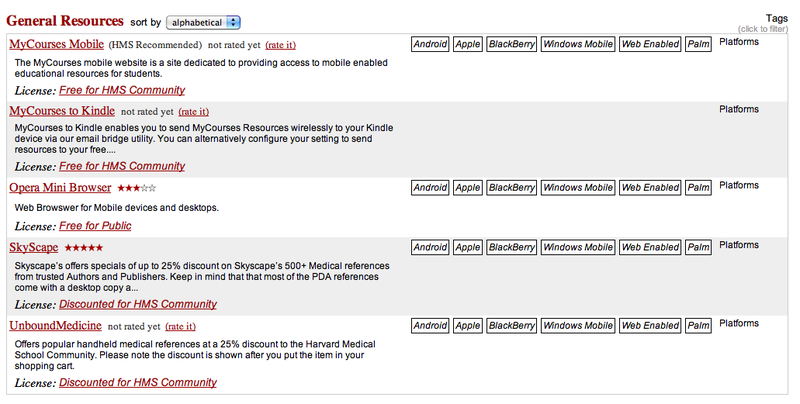 On our Mobile Resources page, we offer downloads of many popular applications. Most include native iPad support. What are the most popular in 2011? Dynamed - a clinical reference tool created by physicians for physicians and other health care professionals for use primarily at the 'point-of-care' . Unbound Medicine uCentral - a collection of popular titles including 5 Minute Clinical Consult, A to Z Drug Facts, Drug Interaction Facts (an interaction checker), Review of Natural Products,Medline Table of Contents Alerts, and Medline Auto Alerts. VisualDx Mobile - a visual decision support tool. VisualDx merges medical images with a problem-oriented findings-based search. Epocrates Essentials - an all-in-one mobile guide to drugs, diseases, and diagnostics which includes Epocrates Rx Pro, Epocrates SxDx, and Epocrates Lab. iRadiology - a compendium of over 500 unique images demonstrating classic radiological findings. I'll post the complete survey for 2011 soon.